A raised desert area on the fringes of Cairo, the Giza Plateau is most famous for its necropolis (city of the dead), which includes the Giza pyramids, the Sphinx, the Solar Boat Museum, and the Valley Temple. The largest and most famous of the Giza pyramids, the Great Pyramid of Khufu, is the last remaining Wonder of the Ancient World. The Giza Plateau is almost always visited from Cairo, although some travelers choose to stay around the pyramids in Giza itself. Most travelers come here for the complex that includes the pyramids, the Great Sphinx, the Solar Boat Museum, and the Valley Temple. Gain access for a significant fee, with additional charges to enter a pyramid and to visit the Solar Boat Museum. It’s also possible to experience the Giza Plateau as a desert adventure with the pyramids in the background, on an ATV tour, a camel safari, or some combination of the two. The Giza Plateau is a must for any visitor to Cairo. There’s very little shade on the Giza Plateau. Wear a hat and sunscreen even at cooler times of year. Walkways make the outside of the pyramids and views of the Sphinx reasonably wheelchair-accessible, although travelers who use wheelchairs will likely want an accessible vehicle to take them around the site. The Giza Plateau is only about 9 miles (14 kilometers) southwest of Tahrir Square, but fiddly to reach by public transport: Note that Giza subway station is some miles from the plateau itself. The 355 and 357 bus routes stop at the airport and the bus station by the Egyptian Museum, but many travelers prefer the ease of a tour that includes door-to-door round-trip transfers. The Giza pyramids are open from morning to afternoon seven days a week, with a Sound-and-Light Show every evening. It’s worth getting up early to beat the worst of the crowds and avoiding the site over the Islamic weekend (Friday to Saturday) and major holiday periods such as Eid. Why Are the Pyramids and the Valley of the Kings So Far Apart? The distance between ancient Egypt’s star attractions is a source of frustration for any visiting history buff: The Valley of the Kings is around 400 miles (644 kilometers) from Giza. During different eras of Egyptian history, the nation had different capitals. The Old Kingdom ruled from Memphis, near Cairo, and buried its royal dead in Giza; New and Middle Kingdom pharaohs centered on Thebes, modern-day Luxor; Cleopatra’s dynasty, the Ptolemies, had their capital at Alexandria. Traveling to Cairo without seeing the Great Pyramids of Giza and infamous Sphinx is like traveling to Paris without making a stop at the Eiffel Tower. Experience the best of this incredible and ancient city on a private tour of Cairo. Follow your own Egyptologist through all the highlights and enjoy personalized attention as your tour the city’s most iconic destinations. The flexibility of a private tour means you can decide how much time to spend at each of the sites, insuring a truly memorable experience. Visit the Great Pyramids of Giza and two other ancient Egyptian must-sees on a full-day tour from Cairo or Giza. With an Egyptologist guide, drive to Memphis, once an ancient Egyptian capital. See the broken sculptures at the archaeological park, including an immense fallen Ramses II statue; and continue to Sakkara, a necropolis famous for the Djoser stepped pyramid, Egypt’s oldest. View the stepped tomb and other ruins, and after lunch at a local restaurant, return to Giza to tour the three Great Pyramids and Sphinx and learn their secrets. 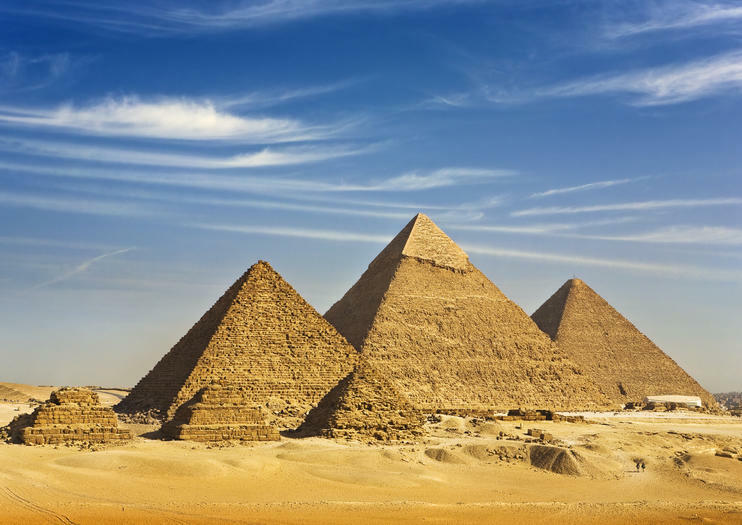 Witness the Giza Pyramids and Great Sphinx on this 4-hour private tour from Cairo or Giza. Travel to the Giza Plateau by air-conditioned minivan, and stroll around the three pyramids, the last remaining Ancient Wonder of the World. Gaze at the massive Great Pyramid of Cheops and the smaller structures of Chephren and Mycerinus as you hear about their construction and the pharaohs behind them. Then, see the valley temple and Great Sphinx, the human-headed statue next to the pyramids, as your guide recounts the mysteries that still surround it. Witness the Giza pyramids, the Egyptian Museum and Khan el-Khalili bazaar on this full-day tour of Cairo, with a private Egyptologist guide. See the ancient pyramids and Sphinx at el-Giza; and discover the mysteries that surround these age-old monuments. Visit the atmospheric Egyptian Museum to see the treasures of Tutankhamun, including his gold death mask and coffins. Then, finish with time at the colorful Khan el-Khalili bazaar to barter for bargains. Enjoy a flexible itinerary that can be tailored to your interests, and upgrade to enjoy lunch during your tour. Witness Egypt’s greatest and oldest pyramids on a full-day trip from Cairo, including an Egyptian lunch. Traveling by air-conditioned minivan with an informative Egyptologist guide, visit the Great Pyramids, Sphinx and mummification Valley Temple at the Giza Plateau. Behold the three world-famous pyramids as you learn how and why they were built some 4,500 years ago. Continue to Sakkara to view Egypt’s oldest pyramid, the stepped stone tomb of the Pharaoh Djoser. Before returning to Cairo, stop at Dahshur to wonder at the strange-yet-beautiful Bent Pyramid and Red Pyramid. Explore the ancient Egypt’s most important sites on a 10-day tour from Cairo to Aswan and Luxor with a Nile cruise and 5-star accommodations. Slip into the historic tombs and temples of the Nile valley as you see the sights by plane, boat and horse-drawn carriage. Walk the necropolis at Saqqara and the Giza Plateau, see Cairo’s religious landmarks, and visit the remains of the Kingdom of Upper Egypt. Cruise from Aswan to Luxor, and disembark to see monuments along the East and West Banks of the Nile. This 9-day Egypt tour is perfect for visitors who want to see it all. The tour covers all the major attractions like the Pyramids of Giza, the Valley of the Kings, Karnak Temple, a Nile River cruise from Luxor to Aswan, and the beautiful Abu Simbel temples. Immerse yourself in the ancient history of the country and its culture with guided tours, trips to the bazaar, and desert camel rides. Experience three of Cairo’s most atmospheric attractions on this private full-day tour with an Egyptologist guide. Make tracks for the Giza Plateau and take in the Great Pyramids and Sphinx as your guide recounts their secrets and how they were built some 4,500 years ago. Visit the Egyptian Museum to see Tutankhamun’s treasures including his death mask; and after a buffet lunch, delve into the Khan el-Khalili bazaar. Navigate the labyrinthine stalls, shop for souvenirs and handicrafts, and if you wish, refuel with a mint tea or pomegranate juice. Stray from the traditional tourist trail in Giza on a private full-day tour of the Giza Plateau and the ancient pyramids from Cairo. Alongside a knowledgeable guide, descend to the atmospheric tomb of Hemnu and gaze at the colossal stature of the Great Pyramid of Cheops as you listen to commentary rich with historical information. Gain an alternative perspective of the pyramids as you ride a camel around the Sahara Desert, enjoying excellent views of landmarks like the Sphinx and the Valley Temple. Receive undivided attention from your knowledgeable guide on this private tour. Get a comprehensive tour of Egypt, including a Nile cruise, on this 10-day tour. Planning an action-packed multi-day tour on your own is daunting; booking this trip means you’ll have everything arranged for you. Sail the Nile on a 6-night cruise, including daily outings during stops along the way. Then step back on land and explore Cairo’s sights with nightly accommodation in a 4-star hotel. Highlights include Edfu, Kom Ombo, Karnak, Luxor, and other can’t-miss landmarks. Visit Djoser’s pyramid complex at Saqqara, the Giza Plateau and Memphis on a private, full-day tour from Cairo, and explore the iconic monuments with an Egyptologist guide. Learn how Djoser’s distinctive step pyramid changed ancient architecture and see the vivid interiors of Saqqara’s tombs. Take in the massive proportions of the Great Pyramid at Giza and meet the enigmatic sphinx, then see crumbled walls and beautifully-preserved statues at Memphis, an open-air museum on the site of a city that once ruled Lower Egypt. Enjoy the personalization and intimacy of your own, private Egyptologist on this one-of-a-kind tour of the Sphinx, Dahshur, Memphis and the Giza Pyramids. Travel back in time as you explore some of the ancient world’s most prized sites with the help of your expert, local guide. Visit Egypt’s most iconic ancient site on a 5-hour tour of Giza’s Great Pyramids and Sphinx from Cairo, including lunch. Head for the Giza Plateau with an Egyptologist guide, and take in the towering Great Pyramid of Cheops and its two neighbors. Learn how they served as pharaonic tombs, and take a camel ride, absorbing the sweeping views over Cairo. See the Great Sphinx, explore the Valley Temple, and visit the Solar Boat Museum to view the reconstructed, original wooden boat of Cheops that was found buried by his pyramid. Marvel at some of the world’s ancient wonders on a full-day tour of the Giza pyramids and the Egyptian Museum from Cairo. Gaze at the iconic landmark of the Great Pyramid of Giza while listening to illuminating commentary from your expert guide. Marvel at the design of the colossal Sphinx; wonder at Tutankhamen’s golden death mask in the Egyptian Museum; and gain fascinating insight into ancient Egyptian history from your knowledgeable guide. Travel by luxury, air-conditioned minivan on this enriching tour. Feel like a pharaoh for the day with this private 8-hour tour of some of the top ancient Egyptian monuments in and around Cairo. Join your certified Egyptologist guide on a morning exploration of iconic sites like the jaw-dropping Giza Pyramids and the mysterious lion-headed Sphinx. Head to Saqqara in the afternoon to discover the Pyramid of Zoser, one of the earliest-known pyramids, before stopping by the ancient ruins of the capital of Memphis. Your trip also covers lunch, private vehicle and round-trip hotel or port transport. Can’t get enough of pyramids? Then check out an array of pyramids, cemeteries and ruins on a private day trip to Giza, Saqqara, Memphis and Dahshur from Cairo. Travel by air-conditioned minivan to see Giza’s Great Pyramids and Sphinx, and visit the 4,800-year-old Saqqara necropolis to view the Djoser stepped pyramid and more. Later, explore the ruins of ancient Memphis and necropolis of Dahshur, where two of Egypt’s oldest pyramids, including the famous Bent Pyramid, await. Enjoy a flexible itinerary tailored around you, as part of the experience. Go back to the time of the pharaohs and discover their history by visiting the great monuments in Cairo & Luxor. Enjoy our offer for two days trip from Alexandria Port to fly to Luxor for one day visiting West Bank and Karnak Temple. Then head to Cairo to witness the greatness of the pharaohs in front of Giza Pyramids. Visit four of Egypt’s greatest pyramids on a private day trip to Giza and Saqqara from Cairo, including lunch. With your own Egyptologist guide, head to Giza to see the Great Pyramids, the remaining ancient wonder of the world, and the Sphinx. Learn how and why these massive tombs were built 4,500 years ago; and continue to Saqqara, home to the even older step pyramid of Djoser. Admire the ancient structure and adjoining mortuary temple as your guide shares stories about the pharaoh Djoser and the pyramid’s design. For visitors that want to see more than the average traveler, a multi-day tour around Egypt—over the Christmas and New Year holidays—is the best option. With this private adventure, visit Egypt's ancient landmarks, relax on the white sand beaches of the Red Sea Riviera, and enjoy an overnight sail on a traditional felucca. Best of all, the private tour includes lots of free time and the itinerary is flexible—just ask your guide—so you create your perfect Egyptian holiday experience. Sample the best Egypt has to offer during this 8-hour, private combination trip to the Pyramids of Giza and Egyptian Museum. Explore the spectacular Pyramids of Giza, learning about their construction and history, before visiting the site's panorama area for picture-taking. After an included lunch, gain additional insight into ancient Egypt at the Egyptian Museum, where you can explore a collection of more than 250,000 artifacts, including the ornate jewelry of King Tut. Your trip includes a guide, entrance fees and round-trip hotel transport.